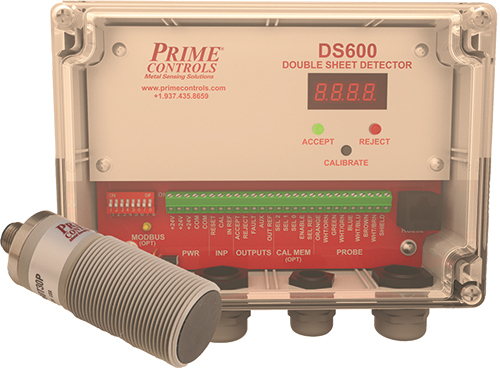 Prime Controls, Dayton, OH, introduces the DS600 double-sheet detection control. When paired with a noncontact, single-probe sensor, it detects nonferrous sheetmetal from 0.025 to 3.81 mm thick. By measuring the effects of eddy currents on the nonferrous sheet near its face, the DS600 can detect the sheet’s thickness and prevent double sheets or excessively thick material from entering presses and other machines. Unlike other single-probe double-sheet detectors, the DS600 system does not need to make contact with the material it measures, helping to avoid surface defects to the product. Housed in an IP65-rated enclosure, the DS600 is thoroughly protected in the typical shopfloor environment. It’s well-suited for automation applications such as robotics, automated destackers, sheet feeders and in-fixture (Poke-A-Yoke) where sensing from only one side is possible. Three versions of the control are available. The basic DS600 model suffices for simply detecting whether a single or double sheet is present. The DS600 Premium is a hands-off product offering eight-slot calibration memory, easily selected through discrete I/O, for quick changeovers with no recalibration required. This model also provides threshold adjustments and variable timing during the detection process for better gauging of thickness. Finally, to meet the growing demand for communication capability among system controls, the DS600 PremiumPLUS features industrial communications in addition to 64-slot calibration memory and memory backup.